The results are far below the 3.6 percent forecast by economists. The economy grew 0.6 percent more than in the previous quarter, with a flat 0 percent growth rate over the full year compared with a 1.6 percent expansion in 2013, according to Monday’s report from Japan’s Cabinet Office. The economy might continue to improve as consumer sentiment showed signs of picking up, Japan’s Economic Minister Akira Amari told reporters after the data was published. Last month the Bank of Japan raised its growth forecast for the fiscal year starting in April to 2.1 percent on the expectation slumping oil prices will boost the economy. However, most economists say consumption and capital expenditure figures are nevertheless weak and disappointing. "These are somewhat disappointing figures", Takeshi Minami, chief economist at Norinchukin Research Institute, was cited as saying by the BBC. "The situation remains weak and companies are clearly postponing investment", he added. 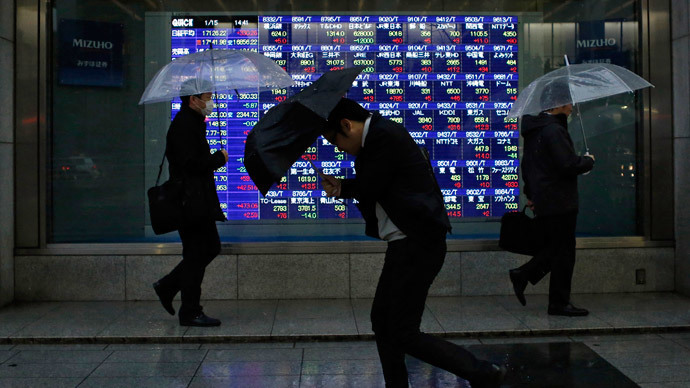 Japan’s economy has been struggling with two quarters of negative growth as consumer spending dropped sharply following April’s sales tax rise aimed at paying down Japan’s enormous $10.46 trillion national debt. Prime Minister Shinzo Abe has been trying to revive the economy since he took power in 2012 and introduced a three-stage policy known as 'Abenomics.' Nevertheless, the yen has weakened about 28 percent against the dollar since then. The sales tax rise, the first in 17 years, plunged the economy into recession, which shrank 6.7 percent in the three months afterwards.